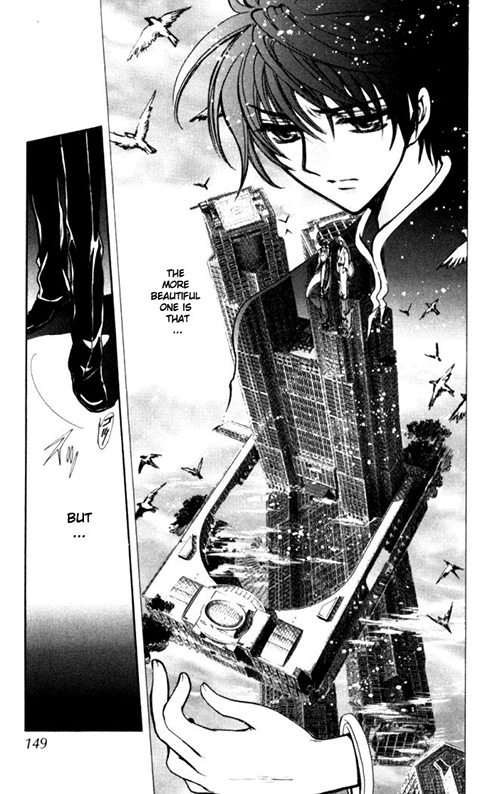 Today I want to hit on one of the oldest and most popular CLAMP series, X (also known as X/1999). X is not as well known now as 10 years ago due to being put on hiatus for over 10 years now, with no end in sight (much like Nana). At this point many fans believe X will never get a “proper” ending, though it still remains a fan favorite. With that said, the series itself cuts off more or less right before its climax. I can’t imagine it having more than 2-3 volumes more to illustrate the final confrontation and the ultimate conclusion, perhaps with some chapters of build-up in between. And the series itself focuses so heavily on foreshadowing that it isn’t too hard to guess what will come next, which is what I will be discussing today. Note: the content below contains spoilers, so read at your own risk! X, at its core, is a story about light and dark and how they are intricately tied into one another. Yin and yang, if you will. The storytelling and the huge mass of characters can get confusing, but within the chaos lies a brilliant, epic apocalyptic tale whose messiness adds to its very own charm. On the surface, the story is simple. The world is foreordained to end in the year 1999. Multiple dreamseers have foreseen this, most notably Princess Hinoto, a dreamseer living under the Japanese Diet Building who traded all of her physical senses for the ability to see the future in her dreams. How the world will end is simple: Tokyo, an ancient cornerstone of the world, is covered with many spiritual barriers and other enchantments that protect the earth and keep it from falling apart. If all of the spiritual barriers in Tokyo were to be destroyed, the rest of the world will also crumble and suffer its end. At the pinnacle of this stands the seven Dragons of Earth, the harbingers of destruction who wish to bring about the end of the world, and against then the seven Dragons of Heaven, individuals who wish to protect the earth. Note that the Dragons of Earth have their own logic – the earth is dying from environmental devastation, and rather than let the planet be poisoned, they wish to give the earth a chance to rebuild and bring about new life. The Dragons of Heaven are aware of this, but choose to defend the current situation anyway for various reasons. At the center of the two sides stands Kamui, a boy with the power to choose either side of the battle. However, whatever side he chooses, there is “another him” who will choose the other side. The dreamseers cannot foresee what side he will choose, but they do see that no matter what he chooses, the Dragons of Heaven will lose. However they conceal this information hoping that perhaps the future could be changed. Kamui eventually chooses to become a Dragon of Heaven because he wishes to protect the world that his best friends, the Monou siblings, live in. To his dismay, the older brother Fuuma is predestined to become his alter-ego, and once he makes this choice Fuuma takes on the personality of “dark” Kamui and becomes a Dragon of Earth, killing his younger sister before Kamui’s eyes. Let’s take a look at the endings that X did have. In the TV series, all of the Dragons of Heaven eventually lose their powers to create spiritual barriers because they lose the most important people to them and the power to create barriers stems from the desire to protect. Princess Hinoto commits suicide to stop her “dark” alter-ego from hurting the Dragons of Heaven, and Kamui goes to confront Fuuma, his best friend and alter-ego. In the final fight, Kamui is killed, but manages to transform his body into a massive spiritual barrier that encompasses the entire world, and also manages to turn Fuuma back to his old self. In the film, all the Dragons of Heaven and Dragons of Earth are eventually killed. 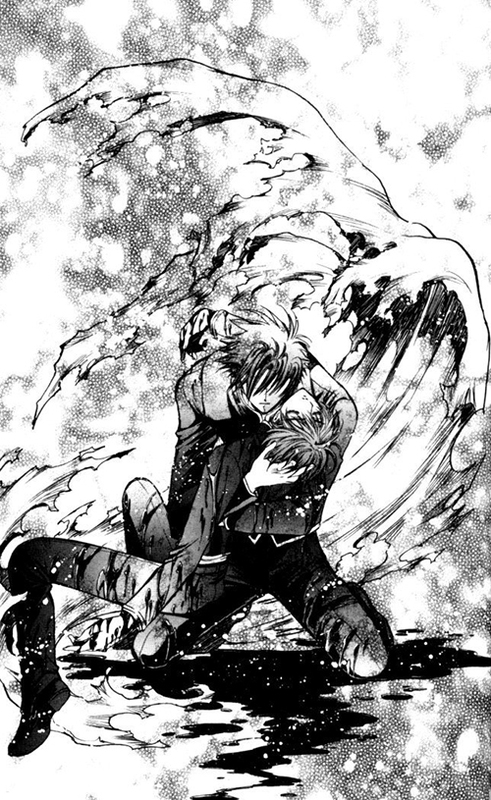 In the final confrontation, Kamui kills Fuuma and is left grieving over the death of his best friend. There are some key points that I haven’t yet mentioned in the summaries above, so let me get to them here. Kamui originally wished to protect Fuuma and Kotori. When all hell broke loose, he decided to walk the path of bringing back the Fuuma he knew, no matter what the cost. But Fuuma has made it clear repeatedly that this is not Kamui’s true wish which even Kamui himself is blind to, and that he will get nowhere until he is able to acknowledge the truth. This makes it rather clear that X cannot end simply with Kamui achieving his goal of bringing Fuuma back. In order to reach a proper ending, Kamui must realize what his true wish is and come to terms with it. This is also, by the way, why I think the TV ending is total BS. This is something that’s emphasized throughout the series which all the other dragons of Heaven can do. Kamui cannot create a spirit barrier, and from time to time he’s shown feeling a bit down about it. But why is that? We know from the series that a prerequisite of creating a spirit barrier is the strong feeling of wanting to protect something. While his supposed goal is to bring back the “normal” Fuuma, the inability to create a barrier indicates that he either does not have anything he wants to protect, or he is unclear about what he wants to protect, which may very well be because the two most important people to him are now gone. With this said, X cannot end without Kamui resolving this quandary, which may very well have to do with him realizing his true wish. I’m not saying he has to actually create a spiritual barrier by the end of the series, but there has to be a specific reason why he hasn’t been able to thus far that will be revealed before the end. While Fuuma initially appears to be the bad guy after his “change,” we soon see that he is much deeper and more interesting than he looks. He claims that he will kill Kamui, yet despite having multiple chances he doesn’t do so. He goes around rampaging and destroying parts of Tokyo, but we also get the sense that he only kills those who wish to die. For example, he kills Nataku who dies protecting Karen, and amidst Karen’s protests he tells her that it was his wish to die for her. We also see him in a fight against Yuzuriha where he asks her if she wants to die. She replies, “Of course not!” and Fuuma tells her that if she truly doesn’t wish to die, she won’t. This manifests in the subsequent fight, where Yuzuriha in her desperation was able to manifest a new inugami (albeit in puppy form) to her own delight, and Fuuma backs off with the parting words, “Looks like you truly did not wish to die,” seeming somewhat pleased himself. This is speculation on my part, but I believe that X cannot end without Fuuma giving Kamui’s (real) wish some sort of closure, whether it be granting it or denying it. It’s the only ending that makes sense, as a wish granter. And here, the only good reason for denying Kamui’s wish would be if it were incompatible with his own wish, such that granting himself his wish would automatically deny Kamui his. We don’t know what Fuuma’s wish is, but even though at the beginning of the series he claims that he will destroy mankind and save the earth, he later reveals that he doesn’t particularly care about the fate of the earth and that he has a wish only Kamui can grant. In fact, it can almost seem like he’s stalling at times, and this would explain why he doesn’t kill Kamui even though he had numerous chances to do so. And this leads me to believe that X cannot end without revealing Fuuma’s true wish. Both wishes are equally important, but in this case the evidence suggests Fuuma will not stop until Kamui is able to both realize and grant his wish, and the conversations Kamui has points towards the fact that he is close to some sort of epiphany. I’m going to go out on a limb here and add that it has to be epic, bloody, painful, and kind of a mindfuck because otherwise it wouldn’t be able to hold together with the incredibly violent and gruesome build-up thus far. They can’t end a series this dark with a sweet little Disney ending or the fans will puke and die of indigestion. So what could Kamui’s true wish be? Many fans speculate that it is to die, and that is certainly one possibility. It’s a recurring theme in X that dying for the sake of the one you love is happiness, and having lost the people most dear to him, perhaps Kamui simply wishes he could die at the hands of Fuuma, his last living connection to the world. This parallels Subaru, whose one wish was to die at the hands of Seishirou. The wording of this is a little tricky. Note that he says “the place” rather than simply “I want you two to live happily,” so it could mean that he wants them to live happily, which subsequently requires a place (the earth) to live happily at, or it could mean that he simply wishes to protect them from disappearing regardless of their own wishes, because he can’t bear to live without them. Which of these might be Kamui’s true wish? Well, the second wish is consistent with Kamui’s desire to hold on to the “old” Fuuma and get him back at any cost, regardless of whether he would hurt Fuuma in the process. And we know that that’s not his “true” wish. Another clue we have is that Kamui is prompted to say this when he sees Kotori smiling happily despite not being wholly in her right mind. So let’s say his true wish is to protect the happiness of Fuuma and Kotori. In fact, Kamui has pretty clear inclinations from the beginning towards becoming a Dragon of Earth. We saw him fighting in the first volume without any care whatsoever for the destruction of the streets. His own mother died as a shadow puppet taking on the suffering of “earth” itself, indicating that she herself was on the earth side, and the above scene proves that Kamui himself feels that the rebirth of earth would be more beautiful than the continuation of the current system. If Kotori and Fuuma weren’t around, it’s very likely that he would have become a Dragon of Earth and not of Heaven. And here we can find the truth behind “light” and “dark” Kamui – there is a part of Kamui which wishes to protect Fuuma and Kotori, but also another, darker side which wishes to lead the rebirth of the planet, a crueler side which may be willing to kill those closest to him to cut out any lingering affections. I believe that this dilemma creates a deep conflicting desire inside Kamui. His true wish is not to bring Fuuma back or to protect Fuuma and Kotori’s happiness, but rather “to bring about revolution without having to do horrible things.” He wants revolution, but he doesn’t want to dirty his hands. And this, my friends, is what creates the Fuuma that we know today. Fuuma is a substitute for Kamui’s darker self, taking on the burden of enacting the revolution, of killing Kotori, of bringing about the change that Kamui secretly desires all the while letting Kamui play the role of the good guy. We know that Fuuma also has a wish, and that wish can only be granted by Kamui. Many readers believe that Fuuma’s true wish is to be killed by Kamui, but I’m not so sure of that. After all, Fuuma is pretty interesting. At first, after his personality “change,” he simply appears to be the bad guy. But as things progress, we get to see more and more of him. Take, for example, this exchange with a little girl in Ebisu, right before he breaks the barrier. And this is the key to understanding Fuuma. Take a look at the sorrowful expression on his face. It speaks volumes about how he truly feels on the inside. I mean, if you think about his question, the answer is pretty simple. If it’s not OK to kill or hurt because “it will make others sad,” then it certainly shouldn’t ever be OK to kill, hurt, or sacrifice yourself for the sake of someone else. And this is something we see clearly come up again and again – Karen isn’t the least bit happy that Nataku died for her. Subaru does not appreciate Hokuto’s sacrifice. Kamui himself was devastated by Kotori’s death. It seems, for all intents and purposes, that the point Fuuma is trying to drive home is that it’s not OK to sacrifice yourself for someone else’s sake, because they definitely wouldn’t want you to. With that said, he also seems to believe that it is better to grant the wish if that is what they truly desire, and he truly does think that it makes the person-in-question happy. When discussing the incident at Rainbow Bridge with Kakyou, he expresses that he believes Seishirou and Hokuto were truly happy, because they were able to die for the ones they loved. So what does this have to do with Fuuma’s own wish? Here’s what I think – Fuuma loves Kamui deeply, not necessarily in a homo way but just as his closest friend and the last important person left in his life. He appears to have the ability to see people’s deepest wishes and also to grant them (which often results in their deaths), but when it comes to Kamui, he is reluctant to grant Kamui death, even if that is what Kamui wants. His deepest wish is for Kamui to understand this, and understand that to the people important to you, the last thing they would want is to see you hurt. To sum it up, Fuuma’s deepest wish is for Kamui to live on, keeping the memories of those who had passed away with him in his heart. Kamui never realizes his own deeper wish or Fuuma’s wish until the very end, just as Kakyou predicted. Fuuma kills Kamui with the Holy Sword, and is left clutching his dead body, his own wish unrealized. He has done the ultimate in terms of “protecting” Kamui, from beginning ’til end, but he himself is left lonely and forlorn, the silent wish-granter with no one to grant his own. A slight variant of this is that Kamui does realize what Fuuma’s wish is, but too late (aka Kamui still dies). Kamui realizes his own, deeper wish to join the Dragons of Earth and bring destruction to the world. In realizing this, he also realizes what Fuuma has been going through as his stand-in. He takes responsibility as Dragon of Earth himself, sparing Fuuma his duties. He may or may not also decide to kill Fuuma to cut his attachment to the world, though if he does it will surely be a painful affair that he does not enjoy, and he will respect Fuuma’s wishes and live on, keeping the siblings in his heart. Kamui realizes his own, deeper wish to join the Dragons of Earth and bring destruction to the world. In realizing this, he also realizes what Fuuma has been going through as his stand-in. This knowledge touches him so deeply that his original feelings towards the destruction of the world is overcome and he truly wishes to protect for the first time in his life the Fuuma in front of him, who is in essence the same Fuuma he knew, just playing the role of a bad guy in order to protect him. Personally, I think all 3 could be likely endings. 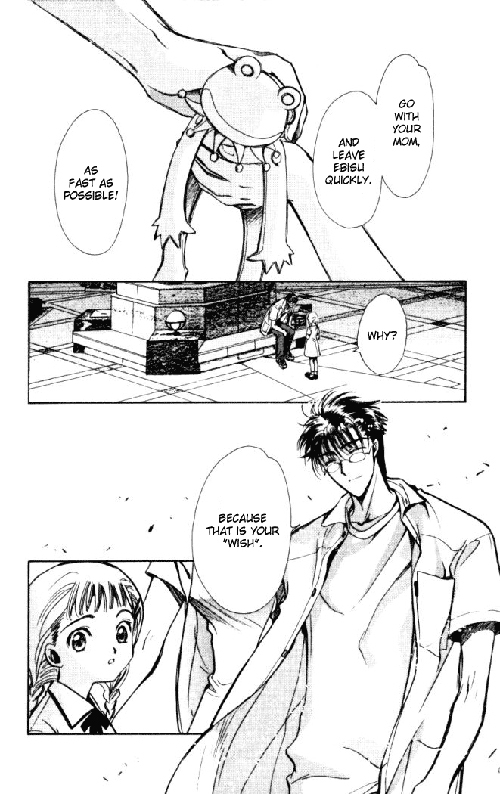 CLAMP isn’t usually the type to end on the note of “you in fact can’t change fate,” so everything happening exactly as Kakyou foresaw doesn’t seem likely. Still, X is so dark and depressing that I could see it doing exactly that (a la Greek-tragedies). CLAMP has mentioned before that the series Devilman had a heavy influence on X, and a semi-tribute version of this could be Fuuma giving a speech like “I’ve granted your wish, Kamui. This is what you wanted to see, right? You wanted the world to be destroyed…” all the while holding onto Kamui’s dead body. Kamui: But you know what would happen to you if I became the Dragon of Earth, right? Fuuma: Yes, and I’m prepared for it. Kamui: *crying* I’m not going to back down any longer. I will take responsibility for my own actions this time. And then he can go on to reform the world, holding Fuuma and Kotori with him in his heart and hoping (perhaps) to meet in the next life. I think it’s also possible that after he kills Fuuma, he realizes that he has made a grave mistake in wishing for the destruction of the world, and apologizes but this is far too late because Fuuma is already dead. The third ending I believe would still be just as tragic, because at this point the world is pretty much destroyed. Kamui might realize that he finally has something he wants to protect, and Fuuma might revert to his gentler self because he’s no longer acting for Kamui’s sake, but at the same time… the flooding has started, and there appears to be nobody left in the world except the Dragons. He might learn how to put up a spirit barrier, but he can’t undo the damage that has already been done. It’s too late for this world. At this point they could die together with the old world or decide to stay alive to witness the birth of the new world. Assuming there is no reincarnation, the second is more likely based on all the messages of “don’t sacrifice yourself” that have been planted in the series so far. I am brazylian and I don’t find good material on web about plots of X. It’s very interesting how you articulated the dreams with a possible ending of the history. I think in a similar way (sorry for my English) and I liked it so much. Congrats. Really nice reading – I admit that the ending of X would definitely remain a mystery, however, sharing our thoughts does help. 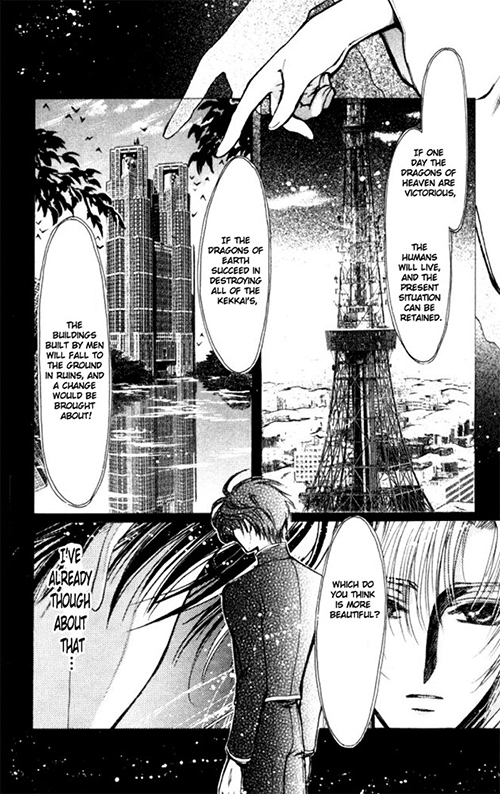 Don’t you think that the universe presented in Tsubasa Reservoir Chronicle also gives a hint about the ending? Although it’s a different world, mankind has survived and the earth has been destroyed. 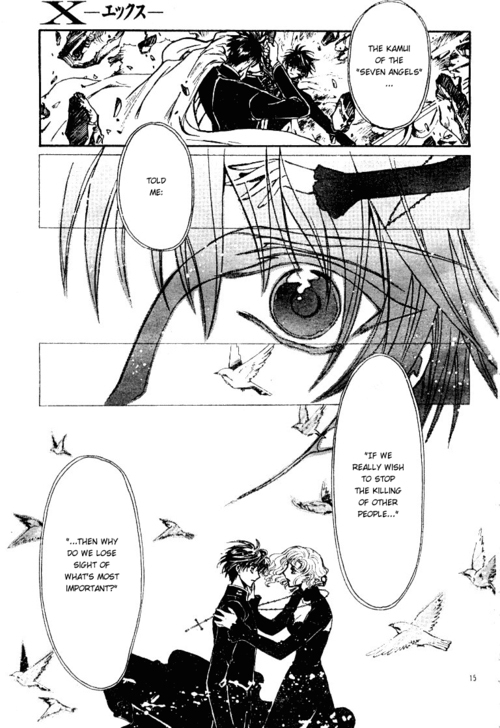 Apart from that, it definitely suits the Clamp’s style to choose love between individuals over everything else. I’ll go with your third possible ending; thanks again for the feedback! I think this is the best Review/Discussion on X Clamp 1999 on the internet so far. There will be no better guesses on the Final Chapter of X than yours. This is just my theory : Kamui didn’t really care about being Dragon of Heaven or Earth, or protecting the Earth or humankind. He only care about Kotori and Fuuma. His wish is beyond protecting both of them. He wants to connect with them, sharing happiness, to be part of Fuuma(? )’s life, not just build defenses. You’re absolutely right about X1999, I’ve read it twice and basically everything is forshadowed. Kamui’s desire and Fuuma’s desires are literally ying and yang, yet clearly, contradictions of what they really want to actualise from each other. Kamui wants to die by the same precious hands that killed beloved Kotori (because nothing is better than being killed by the person you love—reoccurring perspective of death all the time in X1999) thereby having Fuuma live on. Whereas Fuuma wants Kamui to realise that desire will hurt the both of them because they’re both extreme hypocrites, and of course, Fuuma would much rather die by Kamui’s hands (always bloody giving the boy a chance to kill him despite all). Adding to the fact they’re “twins”, and they’re the same person, why the hell would their wishes not correspond with each other. In other cases, if Kamui somehow realises that what he wants protect is not the earth/boytoy but really, all the people around him instead that’s probably when he’ll make his kekkai a reality. Should this happen, I reckon Kamui’s wings will finally look all pretty and white instead of muddled and confused wings. Analysis on character development tells us that Kamui’s found people who mean something to him and this is so very Clamp-like; realising that the world does not revolve around an exclusive relationship with someone you’ve known since your childhood/past because the present/future is ultimately the most important. But more than that, Kamui probably needs to realise there’s only a certain extent of selfishness that he can have, either having everyone or simply just Fuuma will be the choice that determines the fate of the world. In short, his own happiness in exchange for everyone’s happiness, or everyone’s happiness in exchange for his happiness. In the end, I suspect Kamui will kill Fuuma to protect everyone else’s happiness (IT’S JUST SUCH A CLAMP-LIKE APPROACH). Though this is only since Subaru has already done the scenario of doing the best he can of his selfish happiness with Seishirou (on the account of being that he is detached to the world that is without his dearest Seishirou); so Kamui’s scenario will probably balance it out (inevitably attached to the world without Fuuma). Honestly, to gain is to lose, to lose is to gain. So yes! Kamui will need to stop wishing for a physical copy of Fuuma in order to change the future. But does he give up on it is the question. 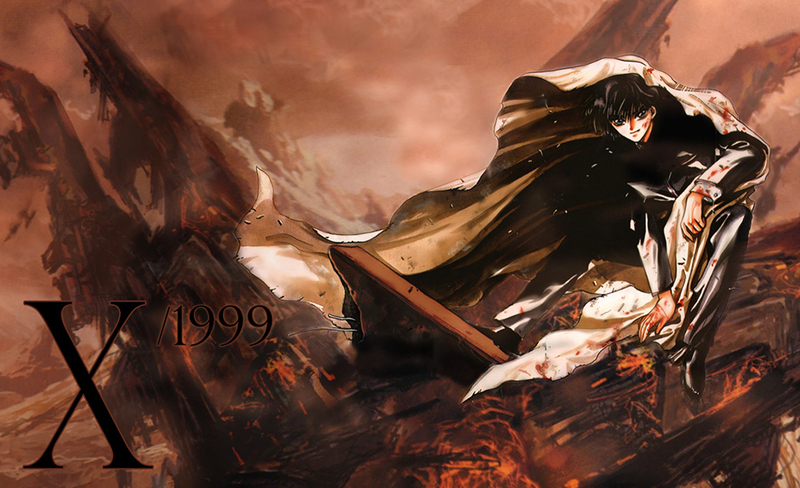 X1999 is dark and it needs deaths in a Clamp-ish way so we can totally count for sure at least more than two will die. I absolutely love this! Quite honestly, your thorough discussion of X gave a bit of closure to me! Thank you so much! I loved it. The manga, I mean, of course and this visión of his end of yours. It’s beautiful and it keeps very well with all the themes CLAMP showed in X. I personally think that they both will end alive, because one of them dying or both wouldn’t make sense at all. That is beacuse the leason of value oneself to be able to love others and be truly happy which the manga has been trying to show?(teach? wathever CLAMP think are doing?) would fall in vain. And they already have another tradegies. So, thank you very much for giving me hope in a non-death-for-fuuma-and-kamui end. I like most of your review but I really don´t think Kamui has a deep wish of destroying the Earth. The fact that in the beggining and in other situations you can see that Kamui has no problem on destroying streets and killing people doesn´t matter in this. One thing that is always being repeated is that the true wish for Earth “to continue as it is” and by this, meaning it´s going to be eventually destroyed, has nothing to do with loving Earth and it´s people, but having someone to love and protect, the afection is the world itself for people. So, when kamui says that he wants to protect Kotori and Fuuma, he wants to protect “a world”, his world. Since the beggining, when he was more cold, he was acting this way exactly so Fuuma and Kotori wouldn´t suffer, so he has never being someone without ties to the world. But I agreed with you that when Fuuma becomes Kamui of the Dragon of Earth he does take this position lightly, he suffers inside. But there is a conversation with Subaru that makes me still think that Fuuma´s true wish is to be killed by Kamui, because when Seishirou dies and Fuuma gives his eye to Subaru, Subaru asks Fuuma if he “intends to do the same thing for Kamui” e Fuuma doesn´t reply, he just looks sad, which, for me, means that he intends to let himself be killed too, just like Seishirou did for Subaru. “Let Kamui live on” and “be killed by kamui”, I understand is not the same wish, but it can still coexist. For example, I do believe that the thing that Kotori always said “the future is not decided” is not only philosofical to the story but in tsubasa gains a knew kind of perspective because Sakura´s feather indeed gives a possibility for a change to the future of the Dragons of Heaven. I´m not gonna say much more about it because I don´t know how much spoiler I could give away on this…. I do believe that that egg Sakura collects on Tokyo Revelations is kamui´s barrier itself protecting what remains of Earth. Not only because the Earth in X has been portraited as an egg that breaks many times but also because Kotori´s simbol is a bird, which nurtures and protects eggs. Well, when Sakura collects that egg, she gives it to Yuuko along with her feather in exchange for water, to keep that feel people alive. Water = Life / The Earth and the humans are made most of water. When they make the trade Yuuko warns the “X people” in that world that if they don´t realise what their problem is they won´t survive and they do survive, because in the end we discover that Clow´s country IS the future Tokyo´s Country so the future was changed, even though the Dragons of Heaven won, the humanity didn´t die. I don´t agree with your interpretation of the scene in which Kakyou asks kamui wich future is more beautifull. In my understanding, in this scene Kakyou is trying to persuade Kamui to give up protecting the humans, not in a malicious way, he is just showing that it makes much more sense to let Earth be revived by sacrificing human kind. That is actually whats the Earth wants, to change. He shows both possible futures knowing that it´s obvious that the most beautifull is the Dragon of Earth future because Earth doesn´t die due to humans abuse, but Kamui tell him that for him, the world consists of the people he loves and he asks “whats difference will it make if the world keeps on living when there are no people”, so he intends to protect people. By the end of that volume he says that he is resolved to bring Fuuma back and there is a picture that by saying this he is enveloped by the black wings, the wing of the Dragon of Heaven. For me, this scene means thats, even though he knows that, he is dooming mankind (because even in the Dragon of Heavens future mankind is exterminated but only much later on) and he is dooming Earth, he prefers the “ugly future” in which everybody evetually dies, including Earth, but he can try and save the people he love even for a little while, for him, it´s worth. I think if he´s wish is to die by Fuuma´s hands, that does make sense to why he doesn´t make a barrier. Because, as you also said, hes true wish is not to protect Fuuma, but to die, so he is not really wishing for the protection of someone. at this point ive pretty much accepted we’re never gonna get the ending and i CANNOT TELL YOU HOW MUCH IT IS PHYSICALLY PAINFULL FOR ME OH Man hhaha so it was great to have some of that gaping void in my heart that X left filled with a great bit of fan theory, which was bloody excellent!!! Just came across this article and its very interesting. Question; when was the last time CLAMP even commented on X or mentioned it in an interview?